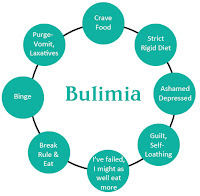 Bulimia nervosa is an eating disorder consisting of a vicious cycle of binging and purging, producing severe physical and emotional problems such as anxiety, shame, guilt, etc. In bulimia, the person feels a commanding compulsion to binge eat, and after eating, feelings of guilt, shame and panic come to the bulimic because he or she consumed around 4000 calories in a short period of time. As a consequence the bulimic induces vomiting. In other cases, bulimia doesn’t involve vomiting; bulimia’s final goal is to eliminate the high amount of calories previously consumed using drastic methods if it is needed, sometimes by running several kilometers, using laxatives, and enemas or diuretics. This disorder appears when a person is obsessively worried about their weight. Bulimics start to introduce themselves into the binging-purging cycle following up a diet. When the diet is strict, the more obsessed the person will become. The feelings of hunger increase the obsession to eat and the compulsion is too difficult to resist. After eating, feelings of guilt and shame come to the bulimic because he or she broke a rule, he or she made something that he/she shouldn’t, and therefore the bulimic purges him/herself in order to feel in control of the situation again. However, purging just make worse things because the sufferer feels the necessity to eat again and thus falls into the bulimic cycle. Bulimia has devastating effects on a bulimic’s life. One of the most serious consequences of this disorder is dehydration. By using laxatives and diuretics the electrolyte equilibrium can be affected, which is connected with lethargy, kidney and cardiac problems. Other problems are abdominal pain, broken blood vessels, weakness, tooth decay, acid reflux and ulcers, menstrual disorders, etc. In order to treat the bulimia successfully, stopping the binging-purging cycle and developing therapies to resolve the true reason of this disorder is required, which is ultimately a poor body image. 1.- First, break the binging-purging cycle. Setting up a correct eating behavior is imperative in order to feel good physically and continue with the therapy, feeling things are being done correctly and no guilt and shame feelings arising. The bulimic must be taught again about his or her eating habits. These habits must be continuously monitored and the bulimic must to learn to identify risky situations. 2.- Second, the bulimic has to change obsessive and unhealthy beliefs and thoughts. Normally these thoughts and beliefs are related to weight, dieting, etc. 3.- Finally, when the bulimic presents a significant improvement, he or she must restore or resolve all of the emotional problems, with much of them probably caused by the degradation of the relationships with his or her significant others as a consequence of the bulimia. Sometimes the therapy is not successful because these points are not administrated correctly, or done so in a different order. In order to have success in the first point, the bulimic must recognize that they have an important problem, and if a partner notices that a person is bulimic they must convince the bulimic that he or she has a problem. The partner always must offer compassion and support. Never must they judge the bulimic, even when the bulimic gets defensive or angry. Insults, guilt trips, and punishments are not useful at all, and are normally the cause of the bad results of the treatments. We never should try to solve the bulimia ourselves; we must look for professional help and advice. We must cooperate with clinicians and the bulimic from an open-minded position. Other causes of the failure of bulimia addiction treatment should not be an example for the bulimic and unconsciously present risky situations to the bulimic. In summary, to have success in the treatment of this disorder an expert must tightly control the therapy, and the familiar and significant others must support the treatment.